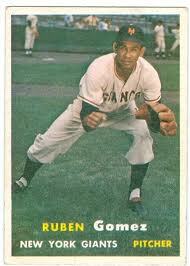 Ruben Colon Gomez was born in Puerto Rico on July 13, 1927. The six foot right handed pitcher was first signed by the Washington Senators 1950 but then was soon traded away. In 1951 he was signed by the A.L. New York team, but was released the next year. 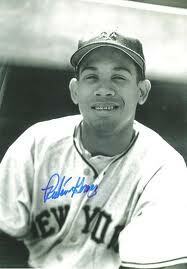 In January of 1953 he was signed by the New York Giants as a free agent. 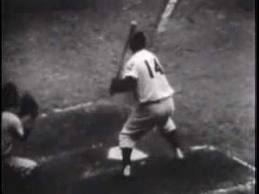 Gomez immediately made the Giants staff making his debut against the Brooklyn Dodgers on April 17th at the Polo Grounds. He appeared in relief, getting roughed up for four runs in 0.2 innings pitched. After a 1-3 start he won three straight games in June. On June 14th he pitched a two hit shutout against the Braves in Milwaukee. He was 4-4 then had a fantastic July, going 5-0 pitching four complete games. On July 9th he pitched another two hit shutout, this time in Pittsburgh against the Pirates. He was 3-3 in August, then struggled in September losing his last four decisions. He finished the year going 13-11 with a 3.40 ERA (8th in the league) he struck out 113 batters, walked 101 in 204 innings in 29 games. He tossed three shut outs & 13 complete games in his rookie year as well. He loved to pitch in tough situations, which earned him the nick name “The Divine Madman’ in Puerto Rico. As a rookie he was thrown right into the Giants Dodger rivalry, when Giants' manager Leo Durocher ordered him to throw at Brooklyn Dodger Carl Furillo. Furillo was furious and went after Durocher in the dugout instead of Gomez. Furillo ended up breaking his hand as the benches cleared. Gomez was known to be wild at times, and also threw at a few other famous players as well. Other Knockdowns: In 1956 he hit the Braves hot hitter Big Joe Adcock on the wrist, and when Adcock charged the mound Gomez threw the ball at him & ran into the dugout. In 1957 he leveled Frank Robinson with a fastball to the head, sending him to the hospital. In the Mexican league he once hit an opponent with a bat. In the Giants 1954 Championship season, Gomez was second to Johnny Antonelli on the staff in wins, with 17. After a 1-3 start he won five straight decisions allowing more than one earned run in just one of those games. In June he pitched a ten inning shutout against the Milwaukee Braves scattering nine hits. He then back to back five hit complete game wins at the end of July & the start of August. From the end of July to the end of the season, he went 9-2 including a perfect September where he went 5-0. On the season he went 17-9 (6th most wins in the league) with a 2.88 ERA (4th best in the league) pitching 221 innings, tossing four shut outs (2nd in the league) & striking out 106 batters (10th in the league). 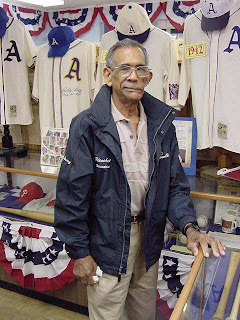 Post Season: In the 1954 World Series, Gomez made history, becoming first Puerto Rican to pitch in a World Series, becoming a hero in his native country. The schools closed the day he pitched in the World Series so the kids could watch the game. When he returned to Puerto Rico, a holiday was declared, in his honor as he was greeted by thousands. 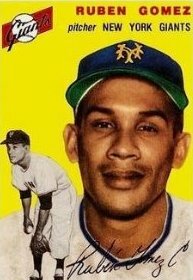 Gómez got the win in Game #3 of the 1954 World Series against the Indians, in front of 71,000 at Cleveland’s Municipal Stadium. He went 7.2 innings allowing just two earned runs on four hits, backed by Willie May’ three hit two RBI day & Dusty Rhodes two run pinch hit single. After the Championship season, his record was under .500 the next two seasons. In 1955 he started out 3-3 but then won five straight decisions, all complete game performances. But after starting out July at 6-3 he finished the year at 9-10 with a 4.56 ERA, nine complete games, three shut outs (4th in the NL) and a save. In 1956, he began the year at 2-7. He suffered through four separate three game losing streaks & finished the year at 7-17 (third most losses in the NL) with a 4.58 ERA. He was even demoted to the bullpen for ten games that season. The Giants fell to sixth place that year, losing 87 games with very poor attendance. In 1957 the Giants played their last season at the Polo Grounds in New York. Gomez led the Giants staff in wins going 15-13 and innings pitched (238). He posted a 3.78 ERA in 38 games, striking out 92 batters while walking 71. A strong start had him at 6-1 in mid May. On June 6th he pitched a four hit shutout against that years World Champion Milwaukee Braves team. In his last game pitched in New York, the Giants next to last game at the Polo Grounds, Gomez lost a heart breaker. He was out pitched by Pittsburgh's Ron Kline taking a complete game five hit 1-0 loss. In 1958 the Giants moved West to California, and on April 15, 1958 he became the first pitcher to win an MLB game on the West Coast. He faced off against the rival Dodgers Don Drysdale at Seals Stadium in San Francisco, and pitched an 8-0 shutout to earn the victory. He went 10-12 and was traded to the Philadelphia Phillies after the season. After two poor seasons in Philadelphia he went to the Cleveland Indians & Minnesota Twins in 1962. He ended up pitching in the Mexican League from 1964-1966. In 1967, at age 39 the Phillies gave him another shot. On Opening Day he finsihed a 4-2 loss to the Cubs at Wrigley Field. Gomez made seven appearances, pitched 11 innings and was released in early May. In a ten-season career, Gómez pitched in 289 games, going 76-86 with five saves. He had 677 strikeouts, with 574 walks posting a 4.09 ERA. Gomez tossed 63 complete games & 15 shutouts. Amazing Story: One day a young boy begged Gómez to buy a lottery ticket because his uniform number matched that of the ticket. Gómez bought the ticket and won $35,000. He attempted to share the money with the boy's family but they refused. He went to a local bank and set up a trust fund for the boy, to be given to him at age 18. In 2001, Gómez was hospitalized with cancer, and needed surgery. A doctor from Mexico requested permission to attend the operation. When Gómez asked the doctor why, he replied, "I was that little boy, and the money that you left in a trust fund was enough to pay for my medical school." Passing: Gómez passed away in San Juan Puerto Rico, in July 2004 at the age of 77 after a battle with cancer. My favorite pitcher growing up was Ruben. He could pitch and play the outfield in winter league. A good athlete in college and on the field. He was rough to other players but was a hero to us fan because he gave himself to his team while on the field.